Are you a teacher thinking about starting your own service? Or a parent who works with one or more freelance educators, like college consultants, tutors or academic life coaches? 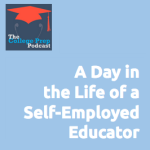 This episode will be especially relevant if you’re wondering whether it makes sense to ease out of teaching, OR if you’re a parent wanting to get the best experience from working with a self employed educator. © 2015 by The College Prep Podcast	/ Proudly powered by WordPress	/ Theme: thebox by design news.